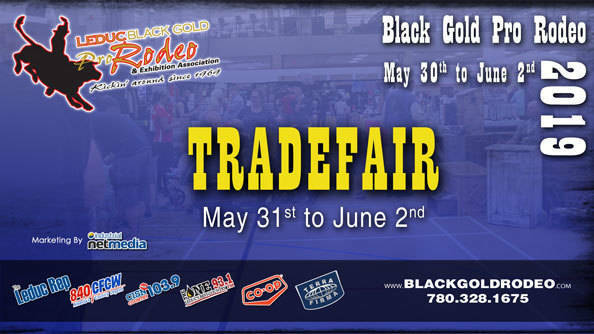 Thousands of people make their way to the Black Gold Trade Fair every year to learn more about local businesses, score a great deal and check out new products and services available in the area! The trade fair features 116 booths, beer gardens, food vendors and live entertainment on the Main Stage. As you make your way past dozens of booths, you'll encounter the best our area businesses have to offer. Free Admission means you can bring the whole family along - there truly is something for everyone at the Trade Fair. Main Stage Live Entertainment! Beer Gardens! Friday: 12 noon to 8 p.m.
Saturday: 12 noon to 7 p.m. The Trade Fair is a wonderful marketing opportunity for all Alberta businesses. Free yourself from your office for a couple of days while you showcase your products and services to thousands of people, attract new customers and network with other business owners. Book early to reserve your preferred spot in the Leduc Recreation Centre Fieldhouses.